We’d love your help. Let us know what’s wrong with this preview of The Delightful Adventures of the Muddle-Headed Wombat by Ruth Park. Wombat and his inseparable friends - the motherly and practical Mouse, and Tabby Cat, whose pride, along with his tabby coat, is always being ruffled - began their careers in a daily children's serial on ABC radio. Since then their delightful adventures in the popular series of Muddle-headed Wombat books have entertained thousands of children in many parts of the world. Thi Wombat and his inseparable friends - the motherly and practical Mouse, and Tabby Cat, whose pride, along with his tabby coat, is always being ruffled - began their careers in a daily children's serial on ABC radio. Since then their delightful adventures in the popular series of Muddle-headed Wombat books have entertained thousands of children in many parts of the world. To ask other readers questions about The Delightful Adventures of the Muddle-Headed Wombat, please sign up. How could anyone grumble-umble about such a terribubbly classic book? I think there should be a lot more Muddle Headed Wombat in the world. Children are being handicapped by the Bummageddons and Twilights and Full Frontal Snogging. I think that possibly we could even achieve world peace if everyone was made to read this book at the same time. Imagine Osama in his cave, giggling his guts out along with Obama in his whitehouse and some random guy in a fur hat. Pure harmony. Definitely loved this one as a kid, even if I remember very little of it these days! It was another I read over and over, and it's always endearing to have Aussie animals take the front seat. how can you possibly go wrong with such an amazing classic in books? i got this book when i was in grade 3, as a going away present from my Pa. always took it with me and i still have it to this day! love this book, absolutely wonderful!! This has aged really well. It's very sweet and humane, and very witty. I really enjoy reading it as an adult, and my 3 3/4 year old is loving it. It's less obscure than Winnie-the-Pooh. I grew up on this book and its interpretation on radio through The Argonauts Club. It's an Australian classic. It was nice and really quite charming, I really enjoyed reading it. A classic Australian children's book; The Muddle-Headed Wombat follows Wombat and his two best friends Mouse and Tabby on their many adventures on holiday, at school and in the treetops. 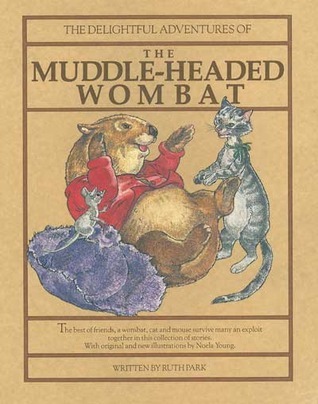 Written by Ruth Park and illustrated by Noela Yound, this edition contains four tales; The Muddle-Headed Wombat (1962), The Muddle-Headed Wombat on Holiday (1964), The Muddle-Headed Wombat in the Treetops (1965), and The Muddle-Headed Wombat at School (1966). I absolutely love The Muddle-Headed Wombat. I grew up w A classic Australian children's book; The Muddle-Headed Wombat follows Wombat and his two best friends Mouse and Tabby on their many adventures on holiday, at school and in the treetops. I absolutely love The Muddle-Headed Wombat. I grew up with these stories and reading them again as an adult was an absolute joy. Sweet, kind-hearted Wombat, caring, practical Mouse and vain, neurotic Tabby are such wonderful characters helping to make Ruth Park's stories timeless classics. The addition of Noela Yong's illustrations really enhanced this book. The illustrations perfectly compliment the story. I really only have one issue with this book. The writing purposely misspelled words and confused sayings, this is because Wombat is a young Wombat who isn't very bright. Whilst I loved this feature as a child, it got on my nerves as as adult. Apart from this one thing, I can't fault this book. I will forever love the stories of Wombat, Mouse and Tabby, and I highly recommend this book to everyone. Adults and kids alike. The Muddle-Headed Wombat is a great Australian children's book that should be read and adored by all. So this is basically the Australian version of Winnie the Pooh. Instead of Pooh bear, we have a muddle-headed wombat; instead of Eyeore/Rabbit, there's a prissy/arrogant little cat; instead of Piglet, there's a helpful & kind little mouse. It definitely suffered the lack of a Tigger (my favorite). It was enjoyable enough to read just as a way to get a sense of the Aussie lore, but like most classic children's lit I found myself at the end wondering, "Why are so many of these books' heroes stu So this is basically the Australian version of Winnie the Pooh. Instead of Pooh bear, we have a muddle-headed wombat; instead of Eyeore/Rabbit, there's a prissy/arrogant little cat; instead of Piglet, there's a helpful & kind little mouse. It definitely suffered the lack of a Tigger (my favorite). It was enjoyable enough to read just as a way to get a sense of the Aussie lore, but like most classic children's lit I found myself at the end wondering, "Why are so many of these books' heroes stupid and mean to each other?" Also: "Why can't children's lit be funnier? Isn't this the perfect genre for silliness?" Omnibus edition of four tales of the Muddleheaded Wombat, and his friends Mouse and Tabby. Sort of an Australian version of Winnie the Pooh in that they stumble into adventures, often propelled there by Wombat's clumsiness or hunger, or Tabby's vanity. Mouse usually is the agent of their salvation with his clear thinking. read this book in year 3 at school and it's such a cute, quirky and fun book. it's a beautiful story for children about friendship and the differences that all friendships have and all people have but about the bonds we all share. the illustrations make the book amazing. This was one of the books my mom would read to me at night when I was younger and I loved it. I had forgotten about it until recently and I was flooded with happy memories as soon as I saw it. Great book for kids. I definitely want to read it with mine. An old favourite that I read many, many times as a child. It was one of the first books I got for my daughter before she was born. I look forward to being able to share this with her in the next few years. Hilarious adventures of a very muddleheaded wombat and his friends Tabby Cat and Mouse. I read this as a child and also listened to the wonderful radio adaptation. Now I've introduced my daughter to the adventures of Wombat. Gorgeous book. Entertaining, though a little dated, childrens tale of a silly but good hearted wombat and his friends--sensible Mouse and the uppity Tabby Cat. Based on some radio plays of the same name for ABC's children's hour which aired from 1951-1970. My granddaughter insisted this was a must read. . . can see why she was charmed, though am not racing to read more! There is some great Australian children's lit out there... I have added a few others to my list: check them out! Listened to the audio version on a long car trip. Dad's review: 3 hours of petty squabbles and irritating voices. Kids' review: Hilarious! Listened to this as an audiobook on our family holiday. Mr 5.5 and Miss 3.5 were entranced and can't wait to listen again on the way home! I loved this book, read it many, many times. I must revisit it! This book was fantastic when I was about nine years old. I don't know if this book is as good as I remember, but I loved it as a child. Ruth Park was a New Zealand-born author, who spent most of her life in Australia. She was born in Auckland, and her family later moved to Te Kuiti further south in the North Island of New Zealand, where they lived in isolated areas. During the Great Depression her working class father worked on bush roads, as a driver, on relief work, as a sawmill hand, and finally shifted back to Auckland as counc Ruth Park was a New Zealand-born author, who spent most of her life in Australia. She was born in Auckland, and her family later moved to Te Kuiti further south in the North Island of New Zealand, where they lived in isolated areas. During the Great Depression her working class father worked on bush roads, as a driver, on relief work, as a sawmill hand, and finally shifted back to Auckland as council worker living in a state house. After Catholic primary school Ruth won a partial scholarship to secondary school, but this was broken by periods of being unable to afford to attend. For a time she stayed with relatives on a Coromandel farming estate where she was treated like a serf by the wealthy landowner until she told the rich woman what she really thought of her. Ruth claimed that she was involved in the Queen Street riots with her father. Later she worked at the Auckland Star before shifting to Australia in 1942. There she married the Australian writer D'Arcy Niland. Her first novel was The Harp in the South (1948) - a story of Irish slum life in Sydney, which was translated into 10 languages. (Some critics called it a cruel fantasy because as far as they were concerned there were no slums in Sydney.) But Ruth and D'Arcy did live in Sydney slums at Surry Hills. She followed that up with Poor Man's Orange (1949). She also wrote Missus (1985) and other novels, as well as a long-running Australian children's radio show and scripts for film and TV. She created The Muddle-Headed Wombat series of children's books. Her autobiographies are A Fence Around the Cuckoo (1992) and Fishing in the Styx (1993). She also wrote a novel based in New Zealand, One-a-pecker, Two-a-pecker (1957), about gold mining in Otago (later renamed The Frost and The Fire). Park received awards in Australia and internationally.